South African whisky. PATRICK LECLEZIO visited Wellington to take a reading. First published in Prestige Magazine (July 2014 edition). When I wanted to get a gauge on the health of the whisky of this country there was really only one man I needed to see. Andy Watts is synonymous with South African whisky; in some 23 years at the helm of the James Sedgwick distillery he has steered the ship (all three of them if you will) from plonk to virtual perfection. His two prodigies, Three Ships and Bain’s, over the past two years, have come of age and earned their stripes, seizing the prestigious World Whisky Awards titles for best blended whisky and best grain whisky respectively. The scale of these achievements cannot be overstated, especially for young, previously unfancied whiskies from the foot of Africa. I sought him out to chat about the journey and about plans for the future. There was a time not so long ago when Three Ships was sneered at and put down with all manner of disparaging names. That was the era of our whisky’s infancy, a time during which Sedgwick’s output was of such low priority to its owners that the distillery was thwarted with old, discarded casks that nobody else wanted. Those days have well and truly been consigned to the past. Andy attributes the turnaround to a new, more serious, and more professional approach to whisky-making, particularly to wood management, instilled during the merger that created the Distell group. The whisky boom, which has been a hallmark of the past ten plus years, helped to justify and sustain the increased investment, with new stills, various other upgrades, and a resplendent facelift further transforming the distillery. It has become a jewel, both in style and substance, of which South Africans can be genuinely proud. I think it’s explicitly apparent to any educated observer that the quality of product has been dramatically elevated, and that it’s now beyond doubt. Three Shits? Not for a long time now, and never again. Ok, that’s great, but is it enough? And if not, where to from here? I recently expressed some concerns about “world” whisky (whisky from emerging producer territories, of which South Africa is one); these and others will be the challenges facing Sedgwick’s and other aspiring local producers as they seek to take their next steps. My main concern hinges on the question of what makes our whisky particular to its region; the answer – nothing, other than the obvious geographical provenance…at least in my view of things. Sedgwick’s produces whisky based on the Scotch model. Accordingly there’s nothing about Three Ships and Bain’s that identifies them as distinctly South African. In fact most of the blends sold under the Three Ships label, including the award-winning 5YO, are constituted with a Scotch component – not just the malted barley, which goes without saying, but actual distilled-and-matured-in-Scotland liquid; this is a policy set to persist for the immediate future (although to be fair the proportions have been diminishing). Even Bain’s, which can at least claim to be entirely indigenous (locally produced only from locally grown raw materials), doesn’t seem to differ conceptually from the whisky of a Scotch distillery like North British, which also makes grain predominantly from maize. Now there may well be divergence of opinion on this issue depending on one’s individual interpretation of what constitutes distinctiveness. When I put the question to Andy, he suggested that the difference was one of focus: whereas grain whisky is considered a filler, subservient to malt, by the industry in Scotland – receiving the short end of the resource stick as a result – here in South Africa it is lavished with the type of care and attention (first-fill casks et al) expected for an heir to the kingdom…which is exactly what it’s considered to be. Bain’s is styling itself as a whisky for emerging markets – light, flavoursome, accessible and easy-drinking – which is set to conquer South Africa, the rest of Africa, and beyond. I liked what he had to say but his response addresses quality rather than style – at least at this stage; who knows what a purposeful dedication to grain may inspire in years to come. For now though even the promising descriptor “Cape Mountain Whisky” is nothing more than a Distell trademark, with no particular definition of its own. It’s a pity, but my guess is that these guys are too busy making and selling exponentially increasing amounts of their whisky to worry about this very much. Perhaps in the future. More promising, at least in this vein, are the new single malt styles being explored by Three Ships. It’s unusual that the brand serves as an umbrella for both single malts and blends – I can’t think of many prominent whisky labels that do the same (Bushmills and…?). Rather the trend is to move in the opposite direction – note Green Label’s relegation to black sheep status in the Johnnie Walker family. I was told that this structure was motivated by the brand’s pioneering nature, manifest in a drive to experiment with different whiskies and styles of whisky. I’m not so sure that this intention has publicly graduated into reality quite yet, but things seem to be percolating behind closed doors. Andy introduced me to a few special, recent creations: two styles of new-make malt (the distillery makes four) – one heavily peated, the other unpeated – matured (or rather finished) in Pinotage casks. South African whisky aged in a South African cask – very encouraging! This is the type of thing that needs to be pursued, and pursued vigorously, if the local product is going to be set apart. The flavours too give cause for belief: robust peat well-balanced with a sweet spot in the one, and a delicious spicy sweetness – the defining feature of Pinotage casks I’m told – shining through to full effect in the other. Three Ships has only released three limited edition single malt bottlings to date – interestingly each distinct from the other as is the convention with vintages, although if these were vintages they were weren’t marketed as such – but there are plans afoot for a permanent malt program in the near future. Let’s hope that these two singular whiskies are included. 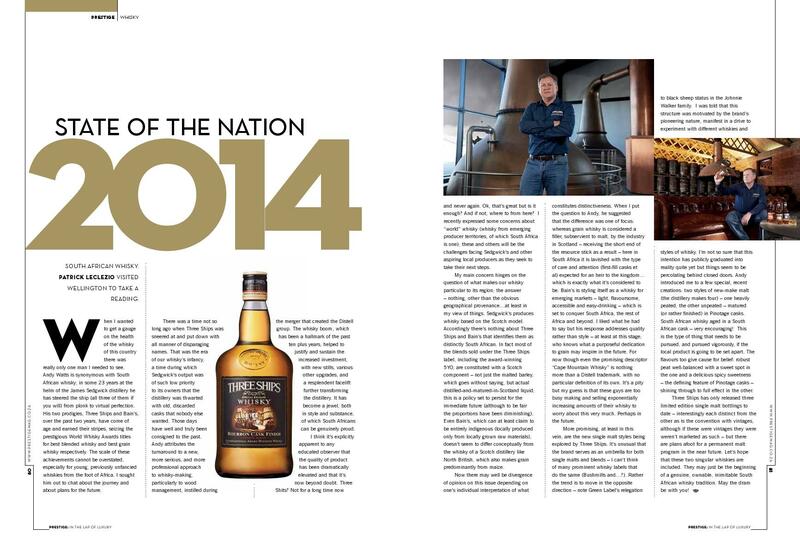 They may just be the beginning of a genuine, ownable, inimitable South African whisky tradition. May the dram be with you! This entry was posted in Whisky column and tagged Andy Watts, Bain's Cape Mountain Whisky, James Sedgwick Distillery, Three Ships, Whisky. Bookmark the permalink.